Like most of my earliest comic book purchases, I picked up a copy of ASM 300 when it first came out at the local corner candy/tobacco shop in my hometown of East Rockaway, NY. A few months earlier, I had purchased what went on to be the first two installments of my “chase,” ASM 296 and 297. 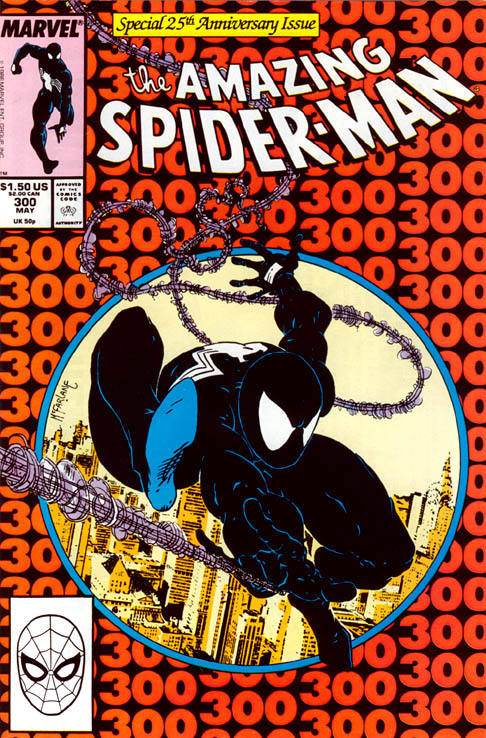 Why I never went on to pick-up 298 and 299 until decades later is lost on me, but as a 7-year-old, I was instantly drawn to the cover of ASM 300 – with the continuous red “300s” that seem to trail off into infinity and the “Special 25th Anniversary” text up top. And the size – a double issue that cost $1.50 to boot! It took two weekly allowances to make this purchase, but I at least had 50 cents leftover to buy a couple of rectangles of Bazooka Joe bubble gum. My brother, new to comics himself but no stranger to collectibles, also picked up a copy. “This is the 300th issue,” he said. “This is a big deal” likely parroting something one of his friends from school told him. So naturally, I parroted him. The comic itself captivated me. There was something to McFarlane’s artwork that just felt so fresh from anything else I’ve seen in a comic book to that point. That’s not to say he’s the best, or even my favorite. 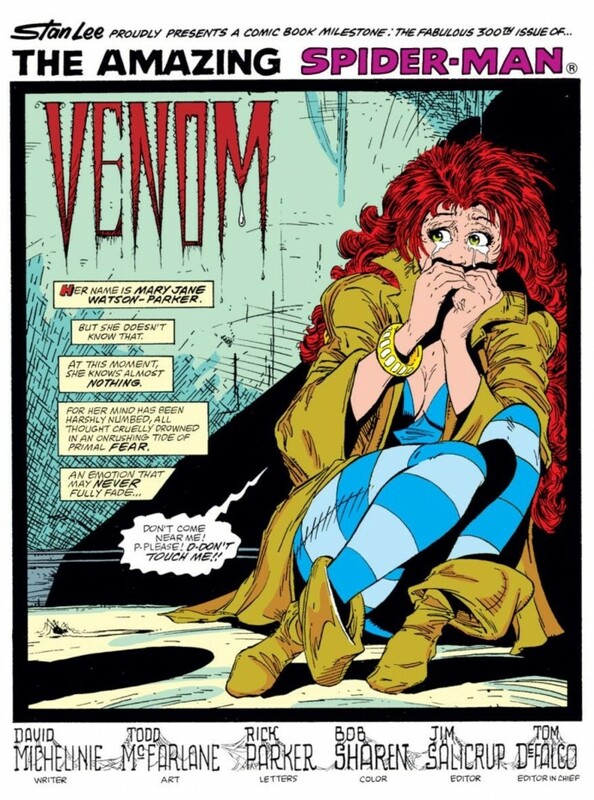 I never really enjoyed his dated interpretation of Mary Jane which was very “80s,” for lack of a better term. But McFarlane was different. 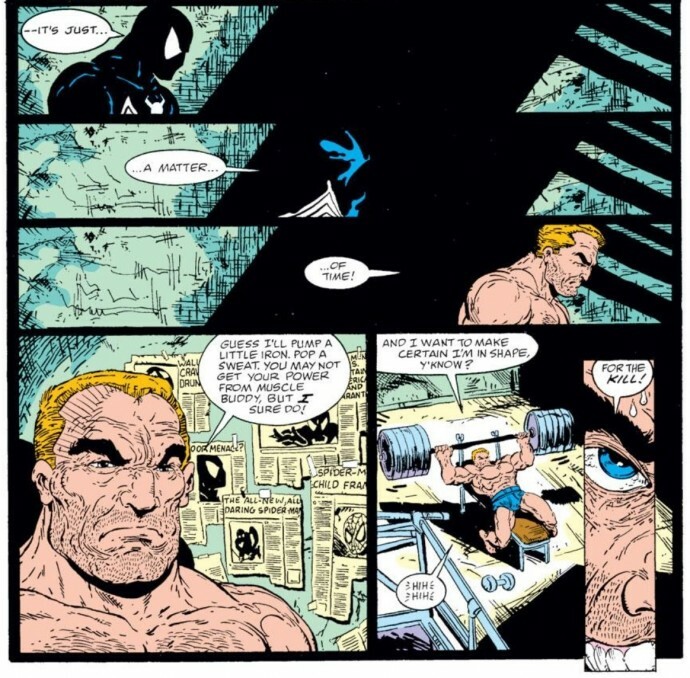 And so was Venom. 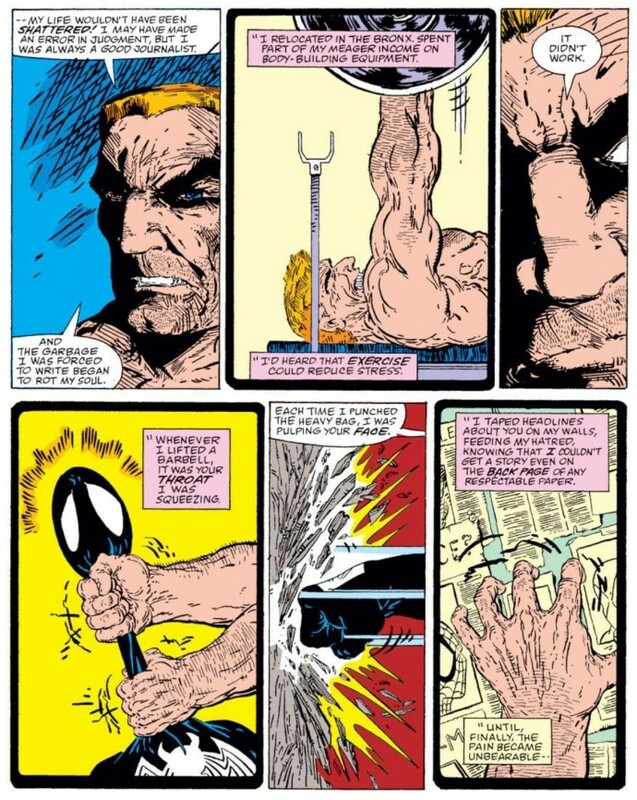 Even when a villain committed the dastardliest deeds, I don’t think I ever felt “fear” of a character while reading a comic book. But then there was Venom. 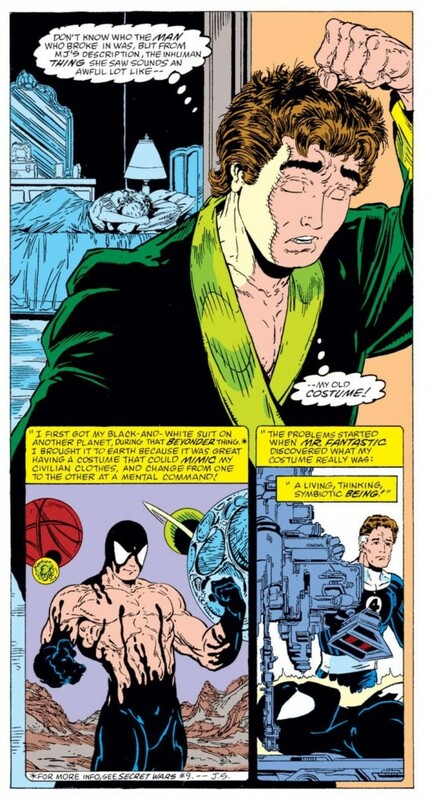 Earlier this week, I talked about the Ying and Yang aspect of Spider-Man’s black costume. 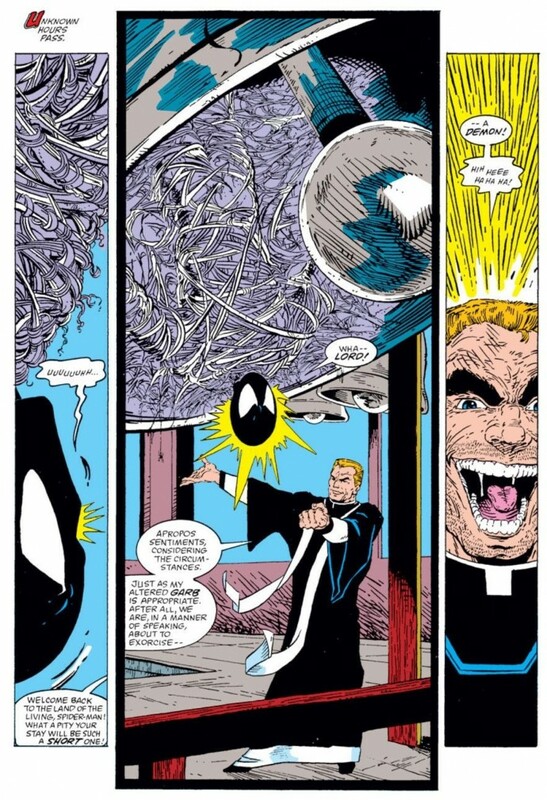 When Eddie Brock/Venom inherited the black symbiote, he was the personification of evil Spider-Man. The same strength, the same abilities. But evil, menacing. Absolutely terrifying. 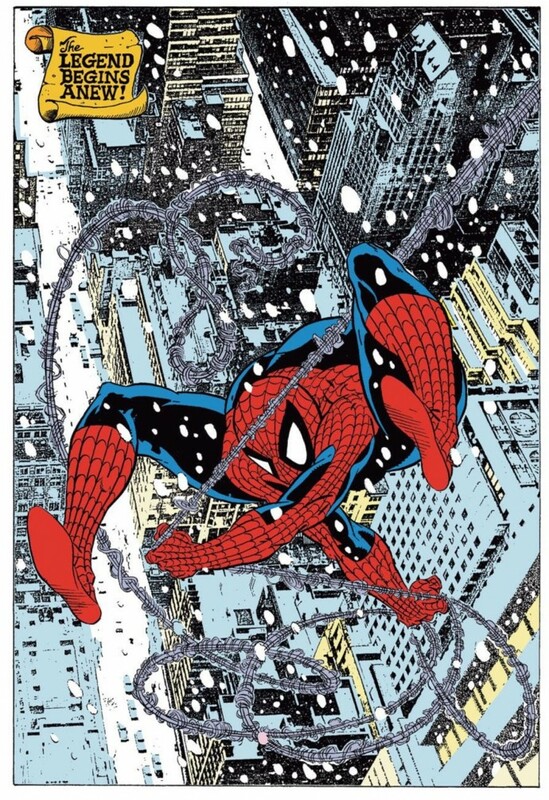 So many of McFarlane’s wild and unique images from ASM 300 have stuck with me over the years. 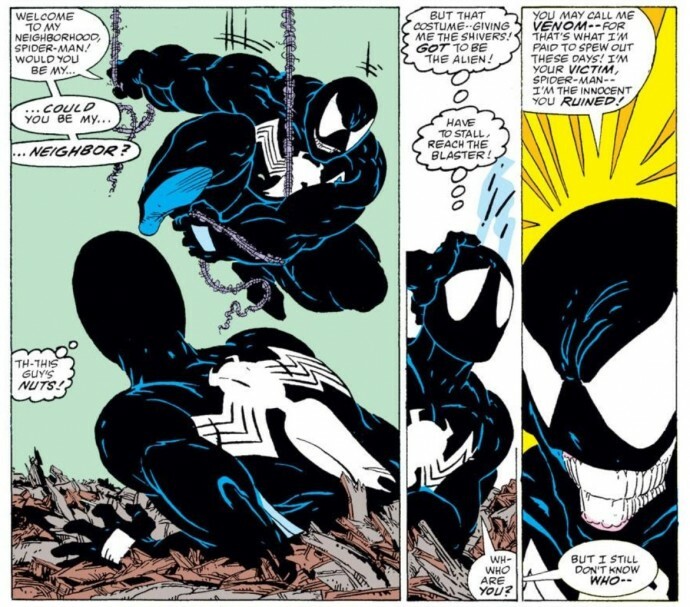 Venom choking Spider-Man like he was Homer Simpson strangling Bart; the black symbiote “joining” Eddie Brock; the saliva, mimicking fangs, dripping down Eddie Brock’s teeth as he laughs with psychotic glee; the Fantastic Four’s Thing in his bathrobe – and is that Felix the Cat (working in Felix into his comics would go on to be a long-running joke with McFarlane); and the dramatic final scene where Spider-Man returns to his red and blue suit. Again, I can’t say that these are my favorite Spider-Man images of all time, but I can’t even remember specific panels this well from issues that came out a few months ago. ASM 300 came out when I was 7. 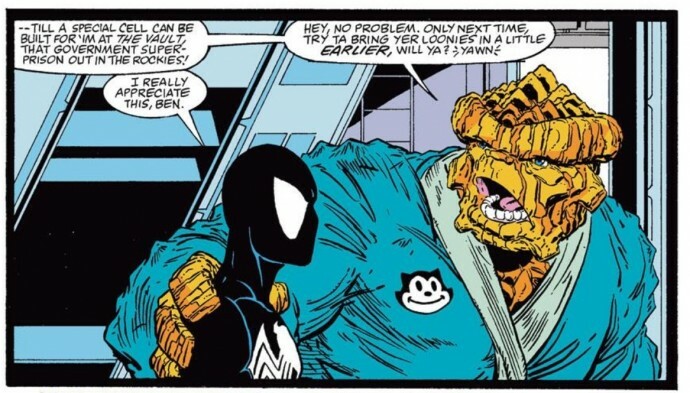 Despite my adoration for the comic, ASM 300 didn’t become significant to me again until about six years later when I was in junior high. By that point, Todd McFarlane was a comic book industry icon, working on numerous other comics and launching the Spawn series, which was all the rage with some of the guys I went to school with. As I was dabbling with the idea of going full-on into “collecting” comics, these guys kept talking about McFarlane’s work on Amazing Spider-Man. While his artwork stayed with me, at that point I wasn’t a serious enough industry person to make the connection that the McFarlane they kept talking about was the same guy who did the artwork for ASM 300. Really? That much for a comic I paid $1.50 for at the candy store? When I checked out my trusty Wizard price guide, these guys were right. Over the span of a few years, ASM 300 had become one of the hottest comic books to ever hit the industry. After learning this, I went to my trusty overstuffed wine box filled with old childhood comics to find my well-read copy of ASM 300. I pulled every Amazing Spider-Man I owned, and even found a few McFarlane’s in there post-300, but no 300. I was distraught. How did I have all these other comics and not the one that was worth $100? I got desperate. The next place I checked was under the bed. That’s where I kept all of my baseball cards and other “collectibles” like all of those Hess trucks my father kept buying for me every Christmas. My logic was, perhaps as a 7-year-old I had enough foresight to know that ASM 300 was going to be worth a decent chunk of change so I hid it under the bed with the rest of my prized possessions. Of course I tore my bedroom apart trying to find it, likely damaging everything in my path. My mom told me to knock it off. Still no 300. My final option was to check the equivalent of the lost Indian burial ground of our household – the boiler room. I had a theory as a kid that if there was something you couldn’t find that you knew you once had, it was in the boiler room. That’s where I found my parents’ old Simon and Garfunkel and Beatles records when I started getting into classic music as a young teenager. Surely I’d be able to find a comic book somewhere in the boiler room. I barely got a foot through the door before my mom stopped me dead in my tracks. In addition to holding every valuable thing I could have imagined, the boiler room also was a storage area for my parents. My mom wasn’t about to let me rip the place up like it was my bedroom. There would be ground rules. If such a comic existed – and my mom was sure that it didn’t – it would have likely only have traveled as far as two or three spots. So I could check there. And nowhere else. And of course, there was no 300. I now had to continue my existence with the understanding that I at one point owned something that was worth about $100 and I carelessly lost it. How was I ever going to be responsible enough to own a car or a house when I couldn’t even preserve a comic book? Pardon the melodrama, but I was depressed. But it also provided me with focus. From that point on, I swore I was going to own a copy of ASM 300 again, and I wasn’t going to pay $100 for it. As I noted in my remembrance of Amazing Spider-Man 63, after my ASM 300 epiphany, I started to make small but measured investments in Amazing Spider-Man. And my quest to collect every issue was essentially born. I scoured local comic book stores and attended comic book shows. I picked up a number of issues from the Silver Age, and always kept my eyes open for copies of ASM 300. Of course nearly everyone was charging full price for it. Until one day, at one of these comic book shows, I saw a copy of ASM 300 in its customary place on the display wall behind the dealer’s table – far enough out of reach that I was going to have to “ask” to see it, giving the seller time to size me up and determine my desperation before naming a price. The God’s must have been smiling on me, because despite my lust for that book, that desire to justify my stupid childhood irresponsibility, the dealer told me I was only going to have to pay $25 for it. Now in retrospect, it’s probably a very fair price. There are some rounded corners, the spine is rolled and after I proceeded to read it another 500 times, I probably damaged it some more over the years. But I didn’t care. I was reunited with the comic from my childhood. With ASM 300 in back in my collection, at such a reasonable price, I finally felt a sense of contentment. Perhaps that’s why a few months after this purchase, my chase went on hiatus. I didn’t have the money to shell out $50-$60 on comics every month and the current Spider-Man product, filled with clones and contrived plots, had soured on me. But none of that matter because I owned ASM 300 – though I’m still pretty sure if I checked a few more places in the boiler room, my old copy will show up. This was such a fantastic post! Spiderman #300 is also my favourite Spidey issue, and it’s my most prized comicbook. I wasn’t old enough to remember it coming out, but as soon as I first saw it, I had to own it! Such an excellent story, I love the idea of the quest, it makes it so much more worthwhile when you achieve it. Great post! Horrible comic! I just can’t stand McFarlane’s Spider-Man, nor the era as a whole.